The International Monetary Fund (IMF) yesterday repeated its age-long advice to Nigeria – remove fossil fuel subsidy and deploy savings from the scheme to fix social infrastructure. She urged Nigeria to establish Social protection Safety Net to help the government meet the needs of people at the lower cadre of the society. About $5.2 trillion has so far been sent on fuel subsidies and the consequences thereof, according to her. She called for more public spending being made available to build hospitals, roads, schools and to support education and health for the people. “Now, how this is done is the more complicated path because there has to be a social protection safety net that is in place so that the most exposed in the population do not take the brunt of those removal of subsidies principle. “So that is the position we take. I would add as a footnote as far as Nigeria is concerned that, with the low revenue mobilisation that exists in the country in terms of tax to Gross Domestic Product (GDP), Nigeria is amongst the lowest. A real effort has to be done in order to maintain a good public finance situation for the country. And in order to direct investment towards health, education, and infrastructure,” she said. 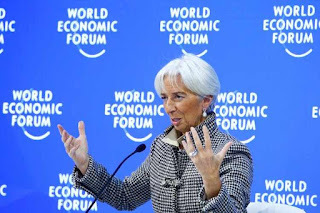 She spoke of the global economy’s uncertainty, adding that the world was a year ago talking about synchronised growth even as 75 per cent of the global economy was going through that phase. On borrowing from China, she said both the World Bank and the IMF were working together to bring about more transparency and be better able to identify debt, terms and conditions, volumes and maturity. “And this is an endeavour that we will pursue together and which the G20 has actually asked us to develop. So we are doing that, we are constantly encouraging both borrowers and lenders to align as much as possible with the debt principles that have been approved by the G20 and that we have endorsed internally and developed ourselves. It is clear that any debt restructuring programmes going forward in the years to come will be more complicated than debt restructuring programmes that were conducted 10 years ago simply because of the multiplicity of lenders and the fact that not all public debt is offered by members of the Paris Club, for instance, which does not mean to say that any debt from a lender outside the Paris Club is an issue as long as the principles are adhered to, the work that we eventually have to do with countries is then facilitated. There is also a myriad of nonpublic lenders that complicates the matter seriously. But that is another story,” she said.